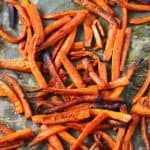 Home » Side Dish » Easy and Tasty Roasted Carrot Fries. Roasted carrot fries are a delicious alternative to potato fries! This healthy side dish is loaded with vitamin A and fiber! 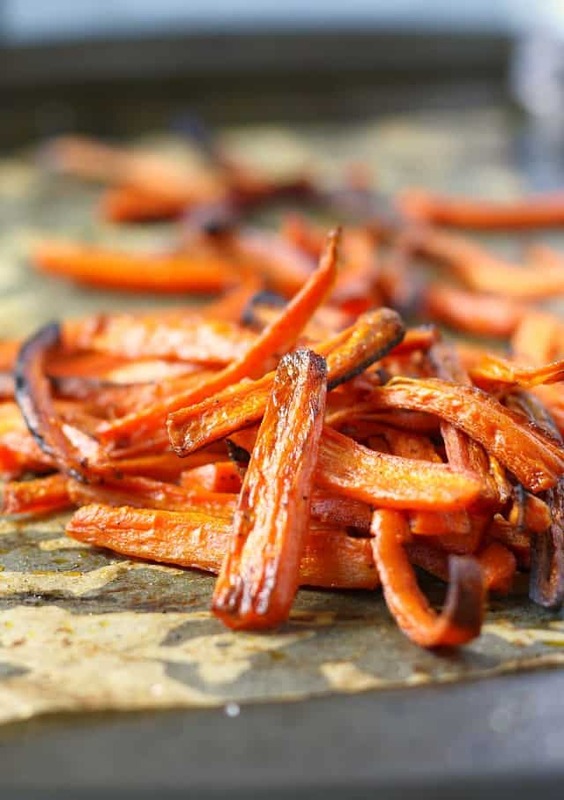 One of our favorite ways to eat carrots is roasted carrot fries. Carrots are a great choice for fries – they’re full of flavor, lower in carbohydrates than potatoes, and they get really delicious when the edges are a little browned and crispy. Roasting vegetables is one of my favorite ways to prepare them. Roasting brings out the sweetness of carrots, and the fry shape is perfect for making these fun for kiddos to eat. If you have a nightshade allergy or sensitivity, you know that potatoes are off-limits. So that means no French fries! Boo. But since carrots aren’t a nightshade vegetable, you can still enjoy carrot fries! Carrot fries are lower in carbohydrates than regular potato fries. They also contain a good does of vitamin A and fiber. Since these fries are roasted, not deep fried, they are also a healthier choice. What can you use instead of carrots? 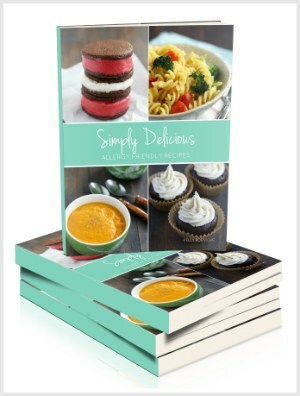 If you don’t have carrots, you could try this recipe with parsnips instead. It’s very easy to make these delicious fries. The hardest part is peeling and slicing the carrots. I love the vegetable peeler I have – I feel like it protects my fingers more than a regular peeler does. When you slice the carrots, go slowly! 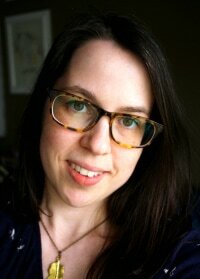 You want to slice them into French fry like sticks – be careful not to cut yourself. If some of the fries get done earlier than others, just remove those from the oven and allow the rest of them to continue to cook. Roast at 450 degrees for about 20 minutes. 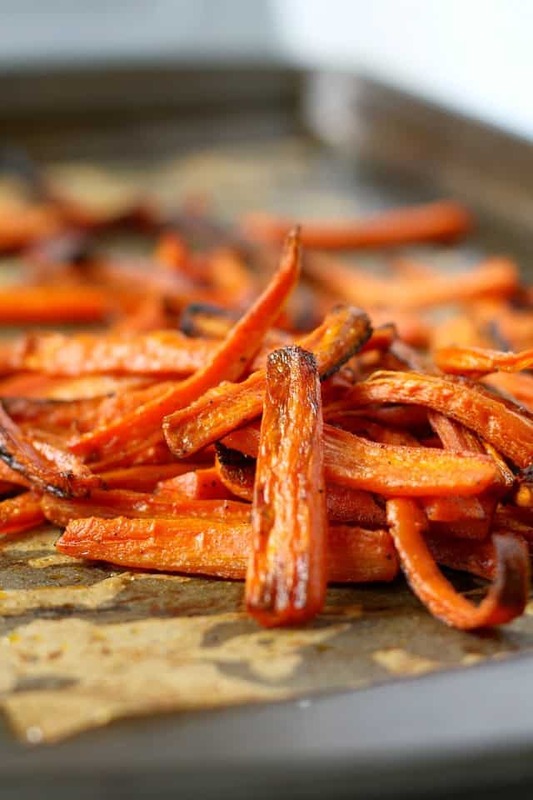 These roasted carrot fries are a delicious side dish that everyone loves! 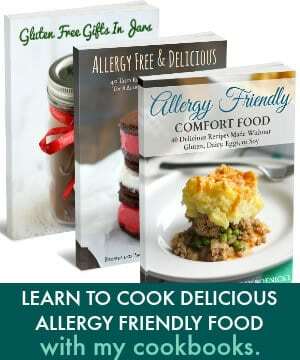 Cuisine Dairy Free, gluten free, Grain Free, vegan. Preheat the oven to 450 degrees. Line a large cookie sheet or two small cookie sheets with parchment paper. 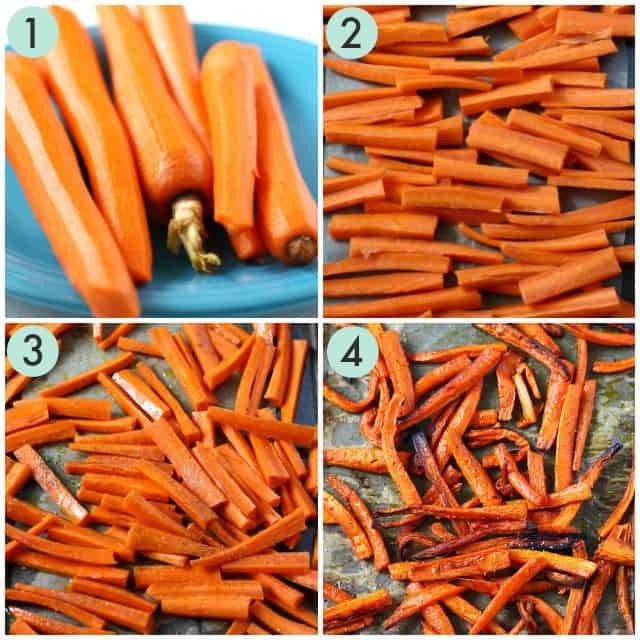 Peel and slice the carrots into sticks about a half inch wide. 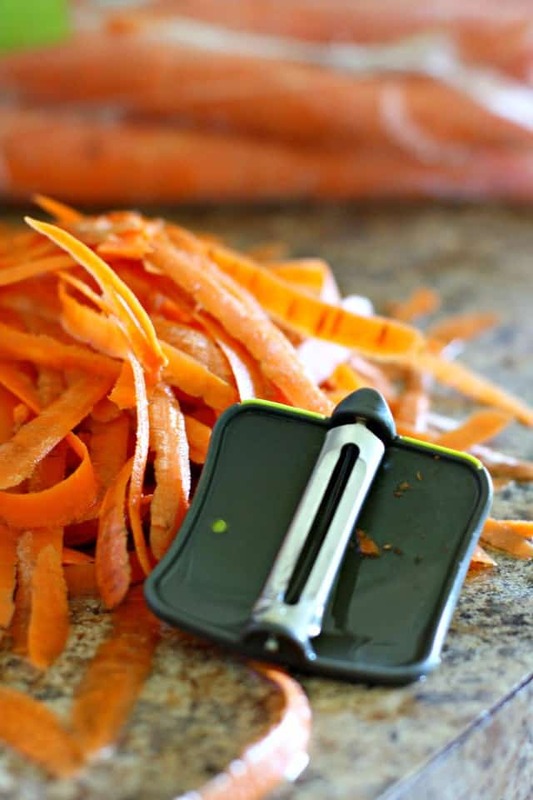 This vegetable peeler does a great job. 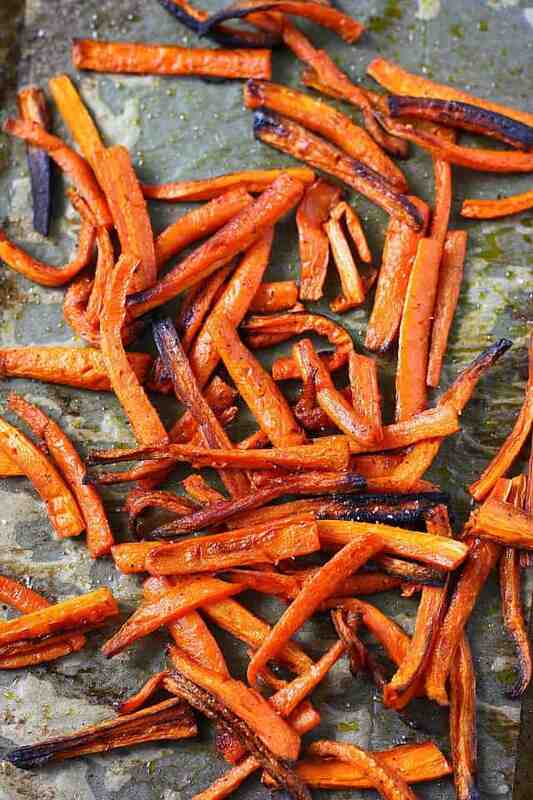 Place the carrot fries on the cookie sheet and drizzle with olive oil. Use your hands to toss the carrots to coat them with oil. Sprinkle with salt and pepper. Bake at 450 degrees for about 20 minutes, tossing once in the middle of the cooking time. 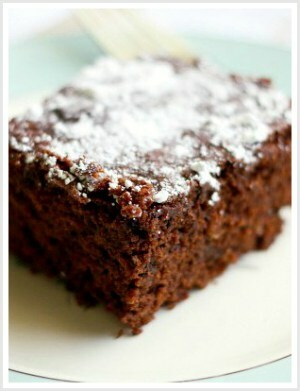 We like ours a little bit browned. If some of the fries are getting too brown, remove them and allow the others to continue roasting. Leftovers can be stored in the refrigerator for a 3 days, but these are best eaten immediately. « Gingerbread Pancakes with Warm Pear Sauce. I have to stay away from nightshades and sweet potatoes are not nightshades; at least that’s what I’ve been told. You’re correct! I changed it!